Burton Albion’s Stephen Quinn chats to The42 ahead of his side’s League Cup semi final with Pep Guardiola’s men tonight. 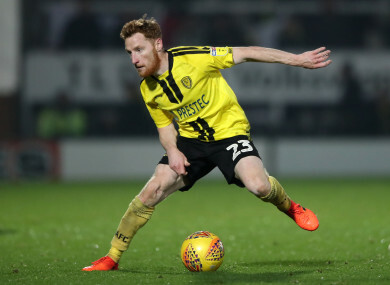 Ireland international Stephen Quinn has got his career back on track after signing for Burton in the summer. ONLY A FEW months ago, Stephen Quinn’s football career was at its lowest ebb. After three frustrating, injury-ridden years at Reading and a season in which he had made just two senior appearances, the disillusioned midfielder was at a crossroads following his release from the Championship club last summer. However, on 22 August, just a few days before the English transfer window closed, it was announced that Quinn had signed for League One outfit Burton Albion. “After three stale years at Reading with injury, at the end of last season, I contemplated retirement, I was pretty much retired,” Quinn tells The42. “I had four months out of the game after leaving Reading. I had no phone calls from anyone. I had nothing, you know? I just thought: ‘That’s it, that’s my career over.’ I just slipped back into society. No one really cares about you. “My agent just rang a couple of clubs near where I live, and [Burton's manager] Nigel Clough asked me to come in and train, and just signed me for a few months. The rest is history. At the time, even Clough acknowledged that bringing Quinn to the club was somewhat of a gamble. “There’s an element of risk to the signing, as there is with every player you sign, especially those that have been out injured,” he told reporters at the time. However, the Dubliner has repaid the faith that Burton have shown in him. Quinn has made 27 appearances in all competitions, having only signed a six-month contract. His current deal expires on 22 January, though he is in talks over an extension that he hopes will conclude imminently and keep him at the club until the end of next season at least. After their relegation from the Championship last season, Burton currently sit ninth in League One, 10 points adrift of the play-off spots and Quinn is still optimistic that they can challenge for promotion as the business end of the campaign approaches. Of late, however, the club’s league form has been overshadowed to a degree by a phenomenal EFL Cup run. Tonight, they play Manchester City in the competition’s semi-final first-leg at the Etihad Stadium. Few people are giving the underdogs any chance of prevailing against the cup holders and reigning Premier League champions. At the time of writing, Burton are priced at 55/1 to beat City, and 150/1 to win the competition outright. However, the Brewers have certainly surprised more than a few people so far. Prior to tonight’s game, they have knocked out Shrewsbury, Aston Villa, Burnley, Nottingham Forest and Middlesbrough. And Quinn, one of the few players in the squad with experience of playing in the Premier League, has been instrumental in this success, starting every game bar the Shrewsbury encounter. Cruelly, however, he might be unavailable for this evening’s clash. Last weekend’s 4-0 victory over Rochdale was marred by a groin injury to the Dubliner, who was forced to withdraw from the action after just 12 minutes. He rates his chances of featuring tonight as “50:50,” in what would undoubtedly be one of the most prestigious matches of his career. The desire for Quinn to be involved on this big occasion though is offset by the caution required in handling an older player who has had his fair share of serious injury problems in recent times. If Quinn does participate, there will at least be an element of fear in the back of his mind, particularly with City having demolished Rotherham, who play one division above Burton, 7-0 in the FA Cup at the weekend. However, Pep Guardiola’s imperious side are not entirely infallible, as was highlighted last season, when they suffered shock 1-0 FA Cup loss to another League One side at the time, Paul Cook’s Wigan Athletic. Regardless of what happens though, should he get the nod to start, Quinn is determined to bask in the type of grandiose fixture that was scarcely imaginable in the darker days of last summer. “We’re a small League One club, but you want to rub shoulders with these guys, you want to tell your kids you played against them and you want to test yourself more than anything and see what the levels are like,” he says. “The manager and a lot of our players have been in the game long enough to know that we’ve got to go out and enjoy it, and the young boys that got through all of those rounds against other Premier League clubs and top-end Championship clubs, they should be relishing it, because they might never play against a club like that again. This evening is set to be the latest in a series of challenges Quinn has faced over the course of the season. At 32, he has had to become reacquainted with League One, having last played a full season there in the 2011-12 campaign at Sheffield United, subsequently competing solely in the Premier League and Championship until the Burton switch. “It’s a pain in the arse at times,” he says of English football’s third tier. “We have a really good footballing side for the league. That’s probably why we’ve caught Premier League and Championship clubs off guard in the cup — because we’ve played so much nice football. When it comes to the league, we’re just a little bit off the play-offs, because we probably want to play too much football. “I think we’d probably do even better in the Championship than League One, because I just find that teams in League One are good at being ugly and lumping the ball, so we’re just trying to come to terms with that. Quinn is not the only Irishman at the club. Limerick-born defender Damien McCrory has featured 16 times in all competitions, while Northern Ireland international and Belfast native Liam Boyce has contributed 10 goals in 25 appearances. Many of his best friends in football, too, are Irish. Paul McShane, David Meyler and Robbie Brady remain close pals from their time together at Hull. And with promotion from the Championship, two seasons in the Premier League and a starting spot in the 2014 FA Cup final where they were narrowly beaten 3-2 by Arsenal after extra time, it is no surprise that Quinn considers the three years he spent with the Tigers as the high point of his career. Quinn is close too with Kilmarnock midfielder Gary Dicker, who he has known since the age of eight, when the pair played together for renowned Dublin schoolboy club Cherry Orchard. However, the majority of those individuals that Quinn grew up with never made it as professional footballers, and for a while, he too was preparing for the worst-case scenario. At 15, he left school and undertook a FÁS course, while continuing to simultaneously follow his passion. During this period, he crossed paths with some notable names, including Noel Hunt, Stephen Kenny and Paul Osam, recently helping out the former League of Ireland star with his current role as coach of the U16 national team. Eventually though, after a brief stint at St Patrick’s Athletic where he made just one first-team appearance, Quinn got offered the opportunity to play football in England, which had previously eluded him. “I went on a lot of trials when I was younger,” he recalls. “I was 13, 14, 15. Myself and Gary Dicker were going on trials. Maybe I was too small or I wasn’t developed enough yet — I was getting knock-backs for fun, so I thought maybe I was done. Quinn would make more than 200 appearances in seven years with the Blades, including a season in the Premier League, achieving his dream of establishing himself as a professional footballer in the process. Some young kids probably come over too early, at 15, and sign for English clubs,” he adds. “They’re not even developed as human beings, they’re in a different country and they’re not ready for it. “You need a lot of things when you’re coming over on a plane from Ireland and you’re trying to take an English lad’s place on the team. It is difficult — you need to have a lot of resilience, hard work and dedication. With the highs and lows, you have to keep a balance and when you get knocked back, I know it sounds a bit corny, but you just have to turn up every day, keep going and staying in the shop window, take the rejections, deal with them and keep battling forward. Yet in comparison to others who have failed to succeed, there is no doubt the experienced Irish midfielder possesses self-belief in abundance. Despite all those rejections from English clubs as a teenager, despite his relatively small stature, despite the relegations and heartache he has suffered over the course of his career, and despite those demoralising few seasons at Reading and career-threatening setbacks they coincided with, Quinn has continually come back for more when lesser footballers would have simply given up. As a result, he has enjoyed a career to be proud of, which has encompassed 18 Ireland caps, including a start in the admirable 1-1 draw with Germany in Gelsenkirchen and a late appearance off the bench during the famous 1-0 victory over Italy at Euro 2016. Sceptics might suggest Quinn is unlikely to play for Ireland again, given his age and current status as a League One player, but it would not be the first time that the indefatigable Dubliner has been written off prematurely. It is no surprise, therefore, that he is defiant as ever when the subject of his international future is raised. Email “'I was pretty much retired' - The rejuvenation of the Irish star aiming to end Man City's bid for glory”. Feedback on “'I was pretty much retired' - The rejuvenation of the Irish star aiming to end Man City's bid for glory”.